Just last month we got a first look photo of Forest Whitaker in Lee Daniels' generation-spanning character-based drama The Butler. The story follows Eugene Allen, a White House servant who worked for eight of the First Families. There's a huge list of talent with small roles as famous faces throughout history, and thanks to co-star Oprah Winfrey, some of them have popped up online. 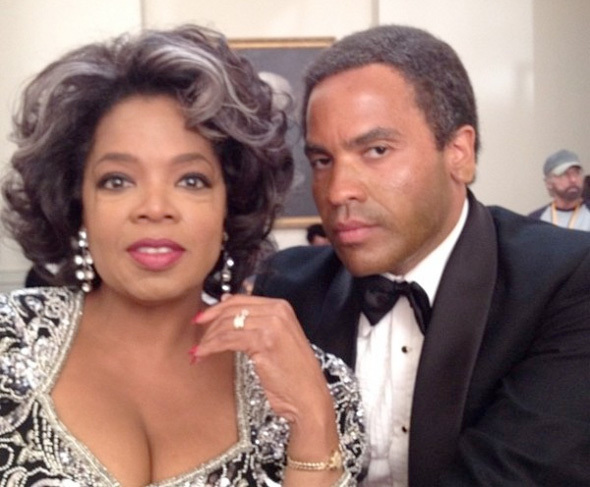 Winfrey is currently shooting, and she took to Twitter to reveal herself and Lenny Kravitz in old-age make-up. But the real treat was a photo revealing Alan Rickman and Jane Fonda in make-up and wardrobe as Ronald and Nancy Reagan. 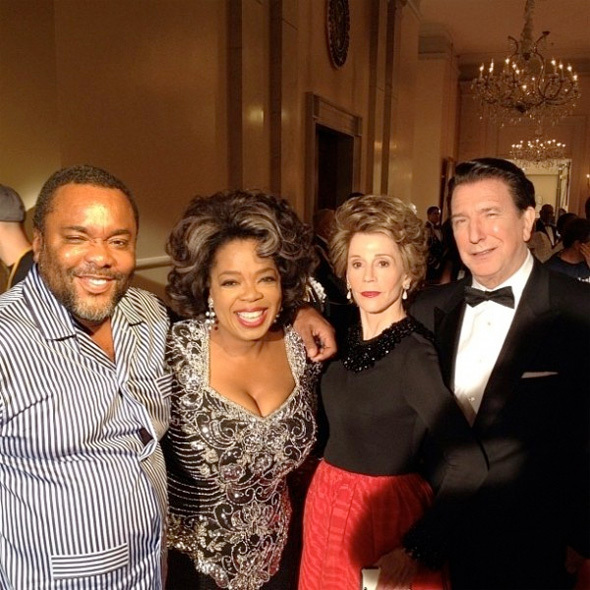 The Butler, written & directed by Lee Daniels, stars Oscar winner Forest Whitaker as the White House butler Eugene Allen, along with an ensemble cast: Oprah Winfrey as Gloria Gaines, David Oyelowo as Louis Gaines, John Cusack as Nixon, Liev Schreiber as Lyndon B. Johnson, Alan Rickman as Ronald Reagan, James Marsden as JFK, Cuba Gooding Jr. as Carter Wilson, Jane Fonda as Nancy Reagan, Melissa Leo as Mamie Eisenhower and Robin Williams as Dwight Eisenhower. Shooting is underway down in New Orleans, and the film will likely hit theaters sometime in late 2013. Looking forward to seeing much more from this. The Expendables of Drama Actors! Holy crap that IS Ronald Reagan! Also, http://www.youtube.com/watch?v=DCk-pHaqXFs sorry, couldnt resist. This is weiiiiird. Someone say a Harry Potter joke! Shooting this down the street at Gallier Hall here in New Orleans. I think the makeup artist for Jane Fonda has got to win an Oscar. Amazing transformation!